Disney has got to be the greatest place in the world for kids, and not because it is fun, but because they think about everything possible. In 1970 my parents took a trip across the country with all four of us kids in a station wagon, towing a camper. One of my strongest memories was of Disney Land. We were standing in a great crowd of people when I was distracted by some object. Don't ask me what it was, I was only five. By the time I came around, I couldn't find my family. I turned around, and seeing a dress like the one my mother had on, tugged on the hem. As she turned around, and I realized it wasn't my mom, I instantly burst out in tears. The poor lady, I'm sure, was horrified at the prospect of this little kid suddenly being her responsibility. After a few seconds of confusion and hesitation, she flagged down a Disney employee. He went into action, whisking this pathetic bundle of blubbering tears away to the nearest information booth. I was completely incoherent, but that did not deter them. Plying me with soda, which distracted and soothed me, they had my attention and trust. Then they reassured me that my parents were just around the corner-- a little white lie to buy them some time and trust. Now quieted, I sat in the booth and watched the crowd go by while the attendant kept me further diverted with little tidbits about what was going on around us. In a short while my parents were found, and came gushing into the booth to get me. 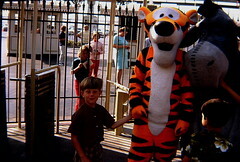 Looking back on it, I think I had more fun in the booth than in the rest of the park. At least, in my dim recollection, I remember it best. 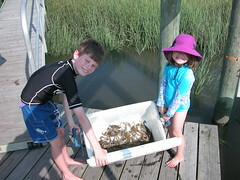 This past weekend my two youngest children and I went crabbing off of our dock. If you've ever done it, you know what it's like: raw chicken (wings, in our case), string (cotton twine, like you use to tie up a roast is best, we had nylon, which is a tad too stiff), lead weights (we found out that something larger than a one ounce weight would work better), a net and a bucket. My children are eight and four, so crabbing is quite an adventure. I tied the chicken on the lines, and put them in. Then I showed them one time how to pull the line in slowly, and quietly net a crab-- the net needs to be waiting in the water next to where you are pulling the crab in. That's all they needed, and they netted over 20 crabs in the next couple of hours while I drank beer (one) and read a book. This all brought back a memory from when I was about four or five. Mom decided that we would have crabs for dinner, and therefore she would take me crabbing up the creek in the johnboat. So she packed up the necessary gear (see above), and threw in a lawn chair to sit on. She has a bad back, even back then (1969 or so), and has to sit a little higher than the boat's built-in seats. And off we went. We arrived at our location, along a bend in the creek where a bunch of live oaks hang out over the water. (Most of the oaks are now gone, as the land around them has been developed, and the "dead" trees were cleared away to make room for the seawalls that have been put in. Pity.) After setting anchor, and throwing out the bait, the time came for the first crab. Naturally, I wanted to see too, so that meant that there was Mom, in a lawn chair, leaning over the side of the boat, and "Billy" edging in to see. It wasn't a very big boat. In fact, in few years later when I was 10, my buddies and I used to capsize it for fun. You know what happened next: flip. We both ended up in the water, and I didn't have on a life jacket. Yeah, I know, shame on Mom, but back then people were used to having more than one child, so spares were abundant. I don't remember much after that, but clearly we were either rescued (I think so), or somehow managed to right the boat and get back home. I can't remember if we had crabs for dinner that night, but I think not. We use to have cats, Havoc and Pandora. Due to circumstances beyond their control, they had to be moved outside to live. We adjusted the garage door so that it closed only mostly, allowing the kitties to sleep and eat in the garage. We live on the marsh, and so get lots of critters, especially at night, looking for food. Possums and raccoons are the most plentiful, but the food we put out ends up feeding stray dogs and feral cats too. Possums are ugly, nasty creatures. When you see photos of them, they are all clean and look like they're smiling. Bah. They are dirty, smelly creatures full of teeth and snarl. But what's funny is that, if you startle them, and I mean really startle them, they faint. Some more than others. We had what must have been a family of possums visiting us pretty regularly. There were three different ones, and one of them must have been a runt because he was so much smaller than the others. I would regularly catch them eating the food, or climbing into the garbage can, and I'd raise cain at them to scare them off— throwing shoes, etc. One night the little one was there all alone. I came crashing out of the back door, raising a ruckus, and threw a sandal at him. He keeled right over. I thought I killed him. When I stepped closer, he reeled, then snarled— scaring me to death. I jumped and hollered, and he keeled over again. Ha! He had fainted. Well, this was great fun! I waited for him to come-to and start for the door and then I banged and hollered again, lunging at him. He took a step and keeled over again, poor thing. I did this several more times, edging him closer to the door each time. It took him about 2 minutes to make it out of the door! From that night on, whenever I caught the little bugger, I would make a racket and he would pass out in the garage. In fact, he fainted so quickly, I had to resort to scooping him up with a shovel and pushing him out of the door— chasing a fainting possum gets old after the first couple of times. Months later, the poor thing up and died on our driveway. We had had one of our holler and faint sessions the night before, and I had to pitch him out of the garage with the shovel. The next morning, I found him several feet away from where I had pitched him, dead. I have to admit that as much as I despised the beast, and wanted him to leave our cat food alone, I felt sorry for him. Clearly he was never well, and I realized that I probably scared the thing to death that last night. This blog is about technical situations I have encountered over the years. Most of what I write here was either learned the hard way, or is something I am constantly repeating to clients — and it's usually both. I have been in the computer support business in one form or another since 1984. I began by helping fellow students at Hampden-Sydney College. From 1986 to 1995 I sold and supported CAD computer systems, in the United States and United Kingdom. In 1995 I founded Computer Consultants Group, Inc., as a computer support and consulting service (no sales). Since then I have focused on support for Macintosh and Windows computers, as well as my other company, Metatation.com, web site design and development and my hobby, photography. I am Christian, have a wife and three children.